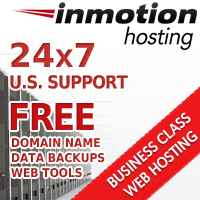 InMotion Hosting Review – Can You Rely on This Host? Running an online shop is the way of the future. Fewer and fewer businesses are setting up brick and mortar stores and instead focusing on operating their businesses entirely online. In order to operate a business that sells products online, you need a good E-Commerce setup. InMotionHosting reviews of their service tell you a lot about the features they offer, but what about the E-Commerce options available? Can you run a successful online shop using InMotion? Continue reading to find an InMotion hosting review of their E-Commerce solutions and to find out if it is worth signing your business up for their service. With most of InMotion’s pricing plans for hosting, there are some E-Commerce solutions offered. For instance, all of their business level plans include the E-Commerce features such as shopping cart software and password protected directories that ensure a smooth shopping experience for your customers. They have a variety of scripts offered that can help you add functionality to your online shop. It is integrated with Google checkout so that you can quickly and easily accept payments for your products. This also offers a safe and reliable option for your customers to pay you. Take your pick… InMotion Hosting provides you with the choice of moving your site from a shared to a VPS or dedicated server as your business needs grow. No more worrying about moving your site as your bandwidth increases, disk space needs grow or site speed issues. As your website increases in traffic and space requirements, InMotion grows along with you. As mentioned previously in this InMotionHosting review, they offer shopping cart software for free with most of their business plans. OsCommerce, Cube Cart and Zen Cart are three very powerful open source shopping cart systems that are fully customizable. You can change and modify the settings until everything looks (and acts) exactly how you want it to. From integrating Paypal to changing colours to adding customization of products for your customers, you can do almost anything. Play around with each one until you find the one that works best for your business. They have over 310 1-click install software to help you set up your site. These range from Blogging software to CMS software to ecommerce software to website builders to wikis, they have many choices to suit your business needs. You will find popular scripts such as WordPress, Joomla, Drupal, OpenCart, phpBB, PrestaShop, and MediaWiki available through the easy installer program Softaculous. They even give you up to $300 in advertising credits to get your site off the ground. Get free advertising credits for Google Adwords, Bing, and Twitter along with a free YellowPages business listing. Being online, it is also important to keep backups of your site regularly. They perform these backups for free so you have peace of mind that if your site were ever hacked into, all information is recoverable. So, what do customers think of InMotion as a company? Is their hosting service reliable? Do they have a lot of down time? How is their support? Until you are able to read some unbiased InMotion hosting reviews, you will not really know enough to make an informed decision. From the reviews, it appears to be a good company that many people love to use. With the many scripts, software, E-Commerce features and benefits, it should work out well for any aspiring online business to build their online presence. Whether you sell a service or are more interested in selling products, there is a solution for you. Having an online presence is something more and more companies are doing. Similarly, more and more customers are starting to shop only online and avoiding “brick and mortar” stores. If you want to maximize the amount of revenue you get on your site, adding a shopping cart is the easiest and best thing you can do. With a 90-day money back guarantee, they take away all the risk. Clearly, from this InMotion Hosting review, it is a viable solution for any personal website or business. We are a professional web hosting review website trying to help webmasters find the best web hosting company according to their needs and budget. WebsiteHostReviewed.com is independently owned and operated. The reviews are based on our own experiences and the opinions expressed here are our own. DISCLOSURE: We receive compensation from the web hosting companies. This does not, however, influence the rankings and reviews on our website. We only give high marks to companies that deserve it. WebsiteHostReviewed.com is in no way affiliated with Google,Yahoo,MSN,Bing,or Alexa. All trademarks belong to their respective owners. We are an independent review site covering popular web hosting services.